Clawhammer is a method of playing the five-string banjo. Unlike Scruggs style, where strings are picked individually using the thumb, index and middle fingers, clawhammer playing has the melody string picked downwards with the nail of the index or middle finger, followed by a strum using the same nail, after which the shorter fifth string is picked using the thumb. Frailing banjo style is closely related to clawhammer and both are widely used among old-time players. This friendly book is filled with clawhammer banjo instruction, tablature, lyrics, tune histories, chords, playing tips, vintage photos, and more. 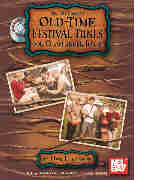 Includes such classic old-time tunes as Soldier's Joy; Cluck Old Hen; Arkansas Traveler; Leather Britches; Mississippi Sawyer & many more. This friendly book and CD set is filled with clawhammer banjo instruction, tablature, lyrics, tune histories, chords, playing tips, vintage photos, and more. Includes such classic old-time tunes as Soldier's Joy; Cluck Old Hen; Arkansas Traveler; Leather Britches; Mississippi Sawyer & many more. A complete survey of traditional banjo styles complete with tunings, playing tips, and the author's deft drawings. Progresses from easy tunes for the beginner to more difficult pieces. 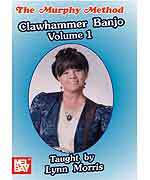 Clawhammer Banjo Volume 1: Rounder Records artist Lynn Morris has taken the mystery out of clawhammer playing! She has broken clawhammer playing into small segments so that you can easily learn this popular style. Using the frailing strum, Lynn takes you through 5 songs in note-by-note detail. Introduces double C tuning. No Tab.